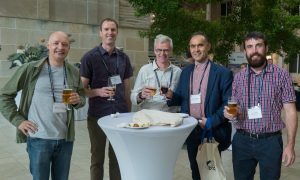 The 3rd Virtual Geosciences Conference took place in Kingston (Ontario) on 22-24 August 2018. This conference is at the intersection of geomatics, visualization, computer vision, graphics and gaming, as well as virtual and augmented reality with applications to a range of geoscience subfields, such as geological mapping, geomorphology, geohazards, glaciology, volcanology, tunnelling, and mining. It was organized at Queen’s University, by Ryan Kromer, a former PhD student of Lausanne and Queen’s universities. The first VGC conference was in Lausanne in 2014 and then in Bergen in 2016. 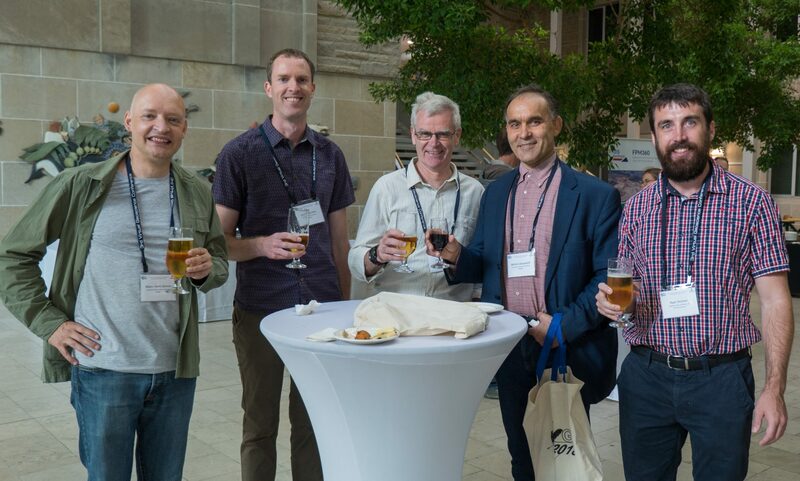 These events are fantastic opportunities to learn how new technologies can be used in geosciences, gathering together people from different horizons. On contrary to hazards which have defined return time for establishing natural hazard maps (for example rock falls or floods), there is no similar methodology for shallow and spontaneous landslides. One way to improve the current methodology is proposed by Cedric Meier, Marc-Henri Derron, Michel Jaboyedoff from RISK-UNIL and Christian Gerber, Veronica Artigue and Melanie Pigeon from the Vaud county administration. It includes the definition of 7 pilots zones based in Jura, Plateau and Alps, on riverbanks or mountain slopes. Based on the new airborne LiDAR acquisition, a former inventory from 1889 to 2013 and basics documents such as geological and topographical maps, air photos, about 110 landslides were registered. 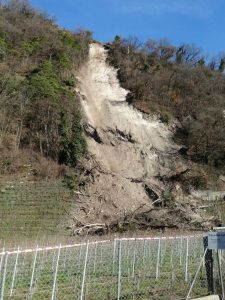 The parameters of the source zone of the landslide, like length, width, estimated depth, area, slope angle and propagation angle (Farböschung) were recorded. For each landslide, 3 different volumes (with half-ellipsoid method, elliptical paraboloid method and Sloping Local Base Level or SLBL method, method developed and applied currently at the Institute of Earth Sciences, ISTE – UNIL) were calculated. A volume-frequency distribution, approximated by the Power Law site specific, but also depending on the slope type was developed. 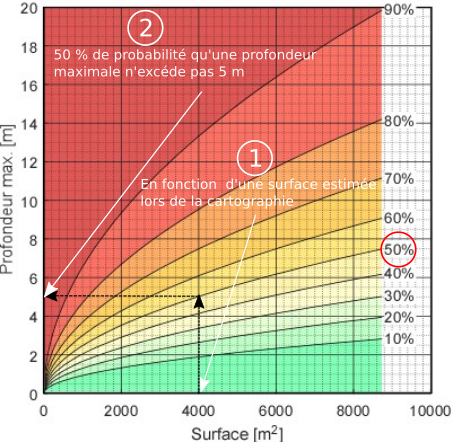 Figures showing the probability of the estimated depth or the volume depending on the area of the source zone were also prepared. For the propagation, only 4 % of the landslide have a propagation angle greater than 13°. Jaboyedoff M., & Derron M.-H. 2005: A new method to estimate the infilling of alluvial sediment of glacial valleys using a Sloping Local Base Level, Geogr.Fis.Dinam. Quat., 28, 37-46.